IN THE FOURTH century, the Roman emperor Constantine laid the foundations for a remarkably durable venture. This was the spread of Christian empire. Constantine’s own empire would divide into Eastern and Western halves, from which multiple Christian empires emerged. One was Byzantium, and another was the Holy Roman Empire. Later European empires were legion: the Spanish, the Portuguese, the French, the Russian, the Austro-Hungarian, and the British empire, with its many claims on modern geopolitics. “Christianity is an inherently expansive faith,” Andrew Preston writes, and this faith has often accompanied imperial expansion. Church and empire were inclined to march together. Or so it must have seemed in Europe until World War I—“Christendom’s ultimate civil war,” in Preston’s words. All the great Christian empires are now dead. France, Spain, Portugal, Austria, Russia, and Britain are no longer empires, and these diminished modern states currently do little to align their foreign policy with Christian causes. If the European Union is a federation of states, and one to which only Christians need apply, it is no empire, and its official language is studiously un-Christian. Preston’s new book on religion and foreign policy is not about Europe. It is about America and Americans. In over six hundred pages, Preston charts the scope and the centrality of religion in American politics, from the seventeenth century to the present. This book merges American history with the history of Christianity, and in doing so it qualifies the story of Christian empire. Unlike the Christian empires of the past, America has never had an established church. Nor did the American Revolution result in empire. The animating spirit behind much of Preston’s narrative is Christian republicanism, and no Christian republic has ever had the territory or the influence or the power that the United States would come to possess. Preston’s argument is worth outlining in detail. It has the shape of a double helix. One strand entails the melding of Christian sentiment with state power, through diplomatic maneuvers and the waging of war. This is the sword of the spirit, cherished by the Puritans and by George W. Bush alike. The other strand inverts the ideal of the church militant, appealing instead to a Christian hunger for international peace, for the beating of swords into ploughshares, for a fraternity of nations liberated from war. This is the shield of faith. Preston weaves these metaphors, both taken from Paul’s letter to the Ephesians, into a sweeping historical analysis. Going forward, Preston accents the Protestant origins of the American Revolution. London was equated with Rome, and “the new political order [in America] newly codified a very old and very Protestant tradition of hostility to arbitrary power,” Preston observes. American historians have outdone themselves in analyzing the Founders and the Enlightenment, the legacy of Hume and Montesquieu in American political thought. Preston notes that “Adams, Washington, and especially Jefferson cited Milton to justify or explain their political views,” citations that reflect the rise of an American-style Christian republicanism. In the place of an established church, and opposed to the Church of England, not to mention the Church of Rome, was the first amendment to the constitution. America’s Christian republicanism could be warlike, and it could just as well be pacifist. A Vermont newspaper labeled the War of 1812 “a holy war,” while this same war so outraged other (no less devout) New Englanders that they publically debated secession from the Union. The War of 1812 provoked “the first truly pacifistic antiwar movement” in the United States, Preston writes. Antiwar movements would continue to emanate from New England for centuries to come. In antebellum America, Christian republicanism nurtured the abolitionist spirit, and the Civil War was (among other things) a war over the proper relationship between the Christian faith and the American polity. Preston applies a consciously contemporary vocabulary to the Civil War. This was “the nation’s first war of humanitarian intervention,” he states, with North and South construed as separate countries, one advanced and the other backwards. Abolitionists defined the Union’s campaign as “a war of liberation.” The Civil War marked another portentous development: the entry of Catholics into American civic life. What had been implacably Protestant, in the American self-conception, was becoming more broadly Christian and was destined to become Judeo-Christian in the twentieth century. Catholics, followed by Jews, did a great deal to link America to the outside world. So did millions of Protestant missionaries in the far-flung lands they were laboring to convert. In the second half of the nineteenth century, these American missionaries were “the brokers of global cultural exchange,” Preston argues, just as the United States was inserting itself into the global economy and scrambling for empire with the great European powers. Between World War I and World War II, pacifist aspirations kept colliding with the call for war. In fact, the American presidents of this period could only justify overseas war by promising international peace. Woodrow Wilson was the first to do so, motivated in his foreign policy by “Christian reformism,” as Preston calls it. Wilson was drawn forward by his vision of a League of Nations, which was to be headquartered in Geneva, “the birthplace of Calvinism and the seat of Reformed Protestantism,” Preston reminds us. Wilson’s dreams collapsed beneath the opposition of more conservative American Protestants. Where Woodrow Wilson failed, Franklin Roosevelt succeeded. FDR’s was a “serene spirituality,” and no less tenacious for its serenity. Synthesizing centuries of historical experience, FDR held “the Christian republican view that religion was the source of democratic freedom because it was the source of conscience and private belief,” Preston writes. Roosevelt pushed this conviction in an ecumenical direction. Catholics and Jews were invited to participate in an American project sure to outshine the authoritarian evils of Nazi Germany and imperial Japan. Preston moves from FDR to John Foster Dulles, who is often pictured as the archetypal anti-Soviet crusader, a dour Presbyterian who happily waved the sword of the spirit. Preston revises this caricature: an “ecumenical Christian,” Dulles “stood at the crux of Protestant idealism and realism.” In the 1940s, Dulles envisioned a world of postwar ploughshares, a joining of global hands, and was enraged when the Soviet Union refused to honor his vision. For Dulles, an idealistic dream of peace came to mandate an eventual Cold War realism. Preston’s double helix of an argument is visible throughout his Cold War chapters. He emphasizes the dissent of Christian liberals from Eisenhower’s anti-communism, rightly dubbing the 1950s “an era falsely remembered for its homogeneity.” The antiwar movement of the ’60s widened such dissent. In reaction, the ’70s witnessed an intensifying alliance between conservative Christians, together with a handful of rightward turning Jews, and the Republican Party. The beneficiary of this reaction was Ronald Reagan, about whom Preston makes two shrewd points. One is that Reagan narrowed religion’s political application, as opposed to Roosevelt and Truman, who sought something broadly national in their religious appeals, and as opposed to John Kennedy and Lyndon Johnson, who shied away from Judeo-Christian fervor. Reagan enthusiastically “deployed religious rhetoric to rally his supporters rather than to bind the nation together as a whole behind a common cause,” Preston contends. And yet Reagan eschewed a holy war with the Soviet Union. His tactic was to imply an ecumenical, peace-loving bond between the American and Russian people, whatever the Politburo felt about the status of the Soviet soul. 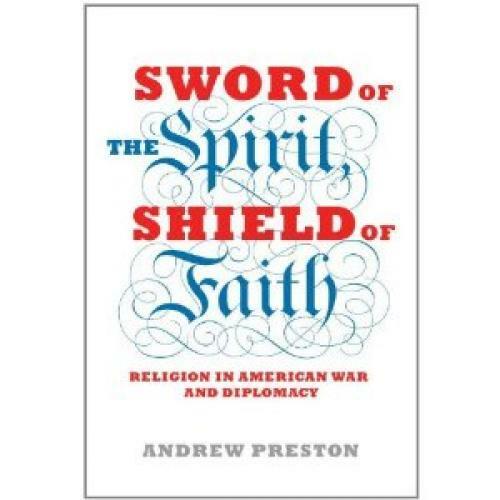 This is the climax of Preston’s argument: “Reagan ... discarded the sword of the spirit for the shield of faith,” and on these terms the Cold War came to its magical end. Preston does not defer to the internet age, with its pressure to streamline, to simplify, and to bundle information behind a sensational thesis statement. Nor is this a conventional academic book: in fashioning an unapologetically master narrative, Preston juggles three centuries and multiple world religions. Coming after a generation of historians who discovered the minority in American history, Preston balances minority with majority in pursuit of his enormous question: in what way has religion invented America? This is all to Preston’s credit. His treatise is neither pedantic nor superficial. This is the rare scholar who can educate a non-academic audience in the complexity of an important subject. Preston cuts through a confusion that often surrounds American foreign policy, by laying bare the unusual moral history behind it, a history that begins with the Puritans and proceeds in the grooves illuminated in this beautifully written book. The book’s problems are a by-product of its formidable ambitions. One is that Preston exaggerates the novelty of his approach. He blames Richard Hofstadter for stigmatizing religion in American history, writing that “until very recently, religion was seen as a mystifying sideshow … sidelined in most fields of modern American history.” But Preston’s massive bibliography challenges this assertion. Historians before Hofstadter were obsessed with the Protestant element in American history, none more than Perry Miller, who moved fluidly between the Puritans and modern America. It does not tarnish Preston’s achievement to mention his return to earlier modalities of historical inquiry. This quibble elucidates a larger problem. American historians—after Perry Miller—moved away from the Puritan-to-Cold War framework because of its overreliance on white male Protestant elites. Preston is alert to this issue, of course, and strives nobly to include Catholics and Jews as well as African-Americans and women. Compared to three-dimensional Protestants like Cotton Mather, Woodrow Wilson, and Franklin Roosevelt, however, the book’s non-Protestants seem minimized and bloodless. Jews, to take one example, come across as a monolithic bloc. After the Holocaust, they “helped enshrine universal human rights at the heart of American foreign policy.” Jews have their spot in the Protestant-Catholic-Jew triad forged in the mid-twentieth century, and they figure, to be sure, in the reconstructed debates over Soviet Jewry and Israel. Even so, their voices in this book are strangely bland, with no palpable connection between their religion and their views on American foreign policy. In this context, the book’s guiding metaphors are instructively ironic, taken as they are from a conspicuous Jewish convert to Christianity: Saul-become-Paul. Preston’s book is understandably saturated in Christianity. Other scholars, by taking on less, can do more to evaluate the role of non-Protestants and non-Christians. Preston’s least satisfying answer to the dilemma of religious variety resides in an oft-repeated phrase, “religious Americans.” Preston writes that “at the end of [World War II], religious Americans celebrated victory over Germany and Japan along with all other Americans.” Distinctions so vast—between those who are religious and those who are not—can only be misleading. A final problem concerns the mechanics of Preston’s argument. Instances of religious rhetoric are countless in American political history. Most politicians have a religious background, and there are thousands of religious groups and institutions eager to lobby the White House and State Department, to cast their votes and to make their opinions heard. Politicians work within these circumstances, and it is easy to demonstrate the religious texture of American political and foreign policy debate. It is more difficult to identify the religious substance of foreign policy decisions, many of which, in their technical and strategic dimensions, do not lend themselves to religious conviction of any kind. A less chronologically ambitious book would have made more space for confronting this problem, which Preston notes in passing. In the 1820s, some Americans advocated humanitarian intervention on behalf of Greece. The Greeks were fellow Christians suffering under the Ottoman yoke; none other than Daniel Webster donated his eloquence to their cause; and nothing happened. This episode, Preston concedes, shows the “limited influence of religion in U.S. foreign policy … when they clashed, presidents and diplomats would usually prioritize national interests ahead of national ideals.” It is a sobering generalization when applied to the rest of the book. But these problems pale beside Preston’s contribution. He explains the prospering of a Christian republic in the American century, a century that no Christian empire managed to outlast. Protestant as America may have been and be, its religious diversity does not bind it to any one church. To the contrary, a recipe has been there, at least since FDR’s presidency, for drawing inspiration and support from many faiths. The plasticity of this relationship—among believer, citizen and the state—allows each generation of Americans to negotiate the political salience of religion, which may be why this salience has not shrunk over time. Preston’s research also explains a crucial plasticity within American foreign policy. Preston stresses the principle of religious liberty in the practice of American foreign policy. Many Americans are Christians, but their foreign policy tradition does not obligate them simply to promote Christianity. Their tradition encourages them, if they choose, to act in support of religious liberty for non-Christians, with the high idealism of American soldiers battling against Hitler or the naïve idealism (or calculated cynicism) of Charlie Wilson sending weapons and dollars to Afghanistan’s anti-Soviet mujahedin. The American sword of faith is unlike Constantine’s sword. Imperial and Christian as the United States might appear, in its own eyes and in the eyes of others, what really matters is the distance between the United States and the history of Christian empire. Without Andrew Preston’s magnificent new book, this consequential distance would be much harder to measure. Michael Kimmage is an associate professor of history at the Catholic University of America. He has two forthcoming books: In History’s Grip: Philip Roth’s Newark Trilogy,(Stanford University Press), and a translation of Wolfgang Koeppen’s Journey through America, (Berghahn Books).